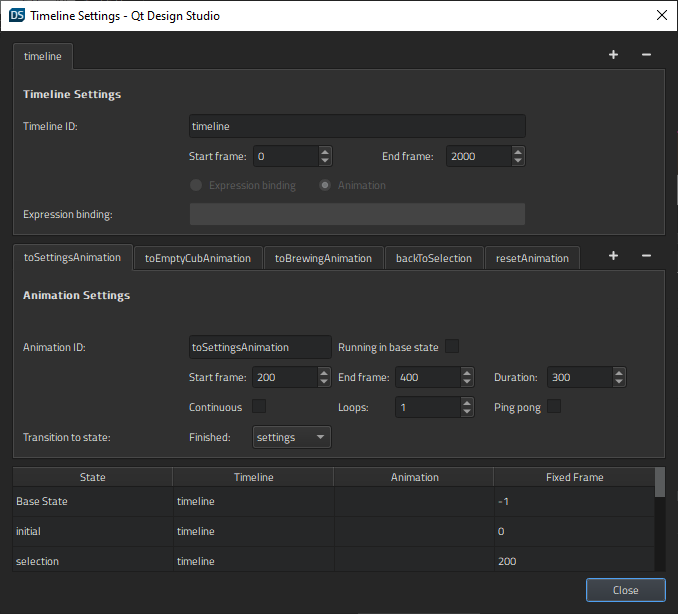 Illustrates how to use the timeline and states to animate transitions in a UI. Coffee Machine lets users choose the type of coffee to brew. They can determine the ratio of coffee, hot milk, and milk foam by using sliders. The progress of the brewing process is displayed as an animation. When the coffee is ready, the startup screen appears again. The ApplicationFlow.ui.qml file contains all the screens in the UI. We use states to display the appropriate screen in the viewport and the timeline to animate the transitions between and on the screens. 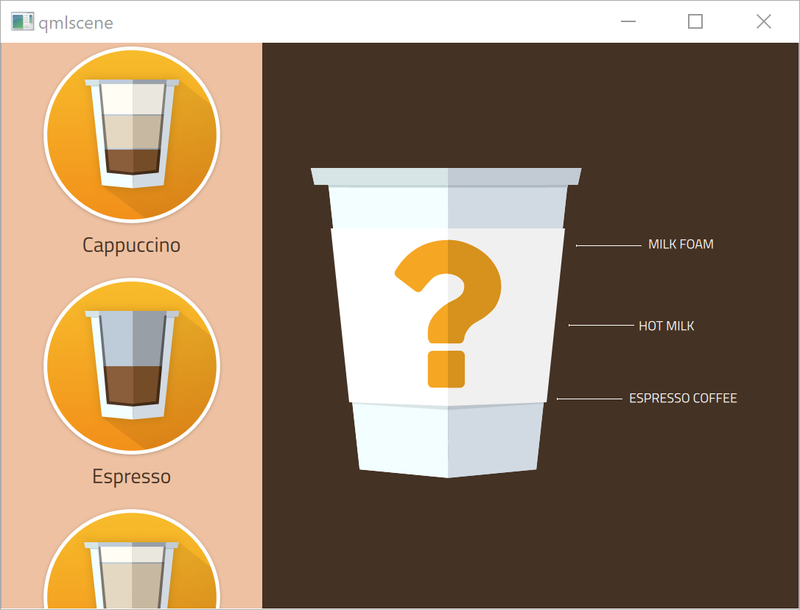 On the startup screen, AnimationFlowForm.ui.qml, users can select from several types of coffee to fill the empty cup. 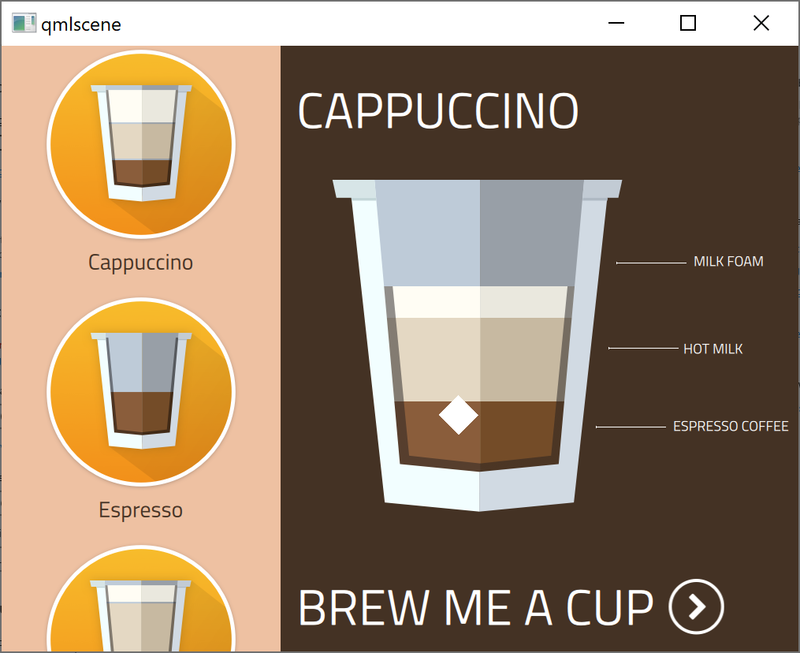 The selection triggers animation1 and animation2 in CoffeeButton.qml. The sideBar.coffeeSelected() signal sets applicationFlow.state in ApplicationFlow.qml to "selection". We will specify the states later. 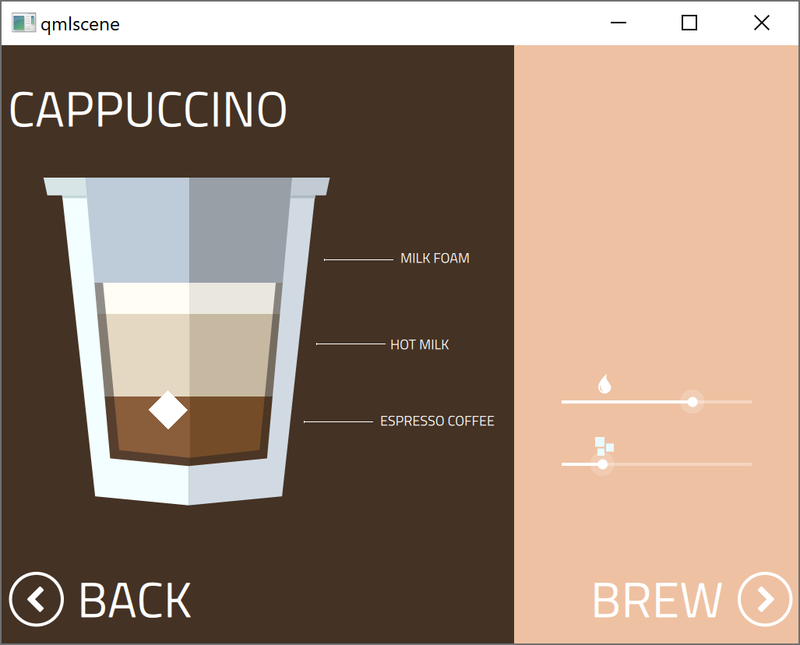 Users can use the sliders for the amount of milk and sugar to change the default values. Clicking Brew triggers the choosingCoffee.brewButton.onClicked() signal handler, which sets the application flow state to "to empty cup". applicationFlow.state = "to empty cup"
Clicking on Continue triggers the emptyCup.continueButton.onClicked signal handler, which sets the application flow status to "to brewing". When the coffee is ready, the brewing.onFinished signal handler is triggered. It sets the application flow status to "reset", so that the application returns to the startup screen. 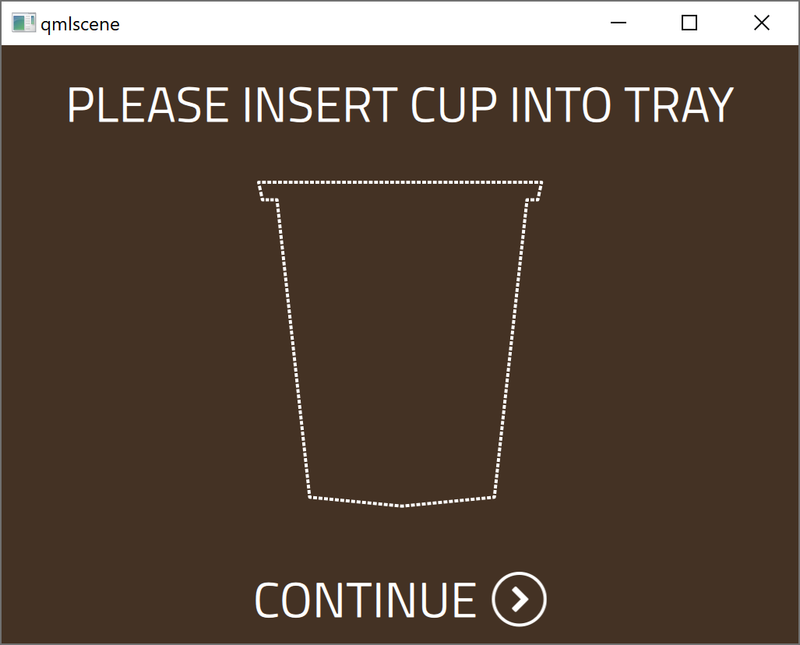 The Coffee Machine application screens for choosing coffee, empty cup, and brewing each use custom QML types specified in separate QML files. We use the Timeline view to animate the transitions between the screens during the application flow in ApplicationFlow.ui.qml. Our viewport contains 200 frames, so we select the button to add a 1200-frame timeline to the root element. We use the default values for all other fields. 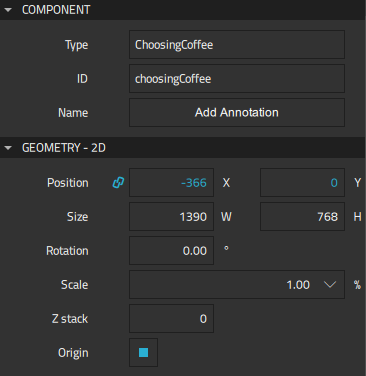 To start recording the transition from the startup screen to the coffee selection screen on the timeline, we select choosingCoffee in the Navigator. We check that the playhead is at frame 0, and then select the (Auto Key (K)) button (or press k). At frame 0, we set the X coordinate to 0 in Properties > Geometry > Position. We then move the playhead to 400 frames and set the X coordinate to -305. In Properties > ChoosingCoffee, we can see the properties of the ChoosingCoffee QML type that we have exported as aliases and that we can animate. We can use the boolean values selected and inSettings to show and hide the settings sidebars on the left and the right. We set the values to true at frame 200, to show the settings sidebar on the right. To hide the sidebar when returning from the final screen to the startup screen, we set inSettings to false at frame 1000. This makes the animation faster when returning to the startup screen. We use the States view to determine the contents of the viewport. The animations are run when moving from one state to another. The brewing state is just a pause on the timeline. We create the states by moving from viewport to viewport in ApplicationFlow.ui.qml and clicking in the States pane. We also create two states for animations that are run when moving to the "to settings" and "back to selection" states. We set the start frame for the "back to selection" state to 400 and the end frame to 200, because we are moving back on the timeline to display the selection sidebar.